Louis XIII of France (27 September 1601 – 14 May 1643) was King of France from 1610 to 1643. He was the son of Henry IV and Marie de' Medici. He lived during the time of the Thirty Years War and had to deal with many rebellions. He was proud of his country, and tried to encourage French artists to stay in France instead of going off to Italy. He did this by giving them work in the Louvre. Although he was married, people thought that he would never produce an heir. Then, after 23 years of marriage, his wife Anne gave birth to a baby boy. He was to become King Louis XIV of France. He died of Crohn's disease in 1643 and was later buried at the Royal Basilica of Saint Denis, France. His oldest son would succeed him on the throne. 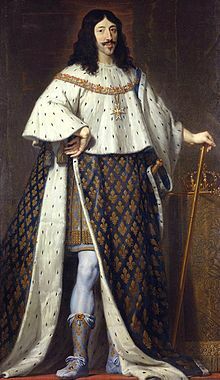 King Louis XIV of France (5 September 1638–1 September 1715) married Marie Thérèse of Austria. Philippe of France, Duke of Orléans (21 September 1640 – 9 June 1701) married Henrietta of England then Elisabeth Charlotte of the Palatinate. ↑ "Louis XIII". NNDB. 2009. Retrieved 2009-09-11. This page was last changed on 27 July 2016, at 07:06.